A book by Shinichi Sawada, a former baseball coach at the University of Morioka Affiliated High School, is about how tough it is to win even a single game at Hanshin Koshien Stadium. The stadium in Nishinomiya, Hyogo Prefecture, is the venue of the annual National High School Baseball Tournament in August (nicknamed the Summer Koshien) and the National High School Baseball Invitational Tournament in March (the Spring Koshien). During his coaching years, Sawada's team played at Koshien seven times--summer and spring--and was eliminated in the first round every time. In the book "Koshien no Makekata Oshiemasu" (Let me tell you how to lose at Koshien), he says one recipe for disaster is allowing oneself to get giddy with excitement. In a flurry of pregame preparations, Sawada once neglected to casually speak to his boys. On another occasion, he fell into the psychological trap of hoping he would make a splash on the grand, national stage. He left his players baffled and confused by ordering them to bunt--something he had rarely made them do in regional games. His team was considered one of the powerhouses in high school baseball, but Sawada still experienced bitter failure over and over. I think this just goes to show the tremendous pressure Koshien exerts on every team and coach. 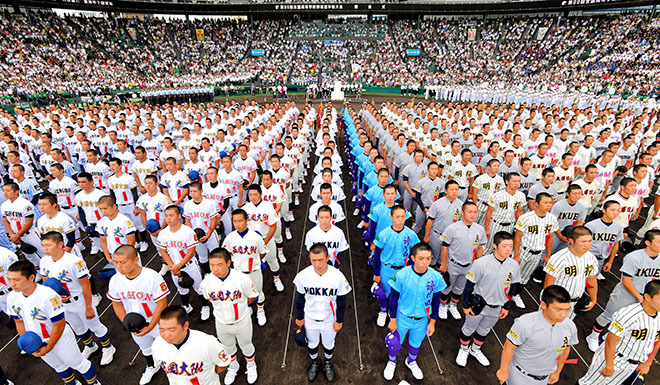 This year's Summer Koshien kicked off on Aug. 8. The action was delayed by one day due to inclement weather. On Aug. 7, players practiced indoors at nearby universities and other facilities. The Asahi Shimbun quoted one player as saying, "I'm trying to thank the typhoon for giving us an extra day." I hope the delay has at least helped everyone keep their cool. This is the season many people head to their hometowns, where they will likely celebrate the annual Bon festival and root for their local high school playing at Koshien. "I believe going home will enable people to doubly reconfirm their identities," wrote Satoshi Shimizu, a sports sociologist. They will be experiencing the exhilaration of watching young ballplayers in action, and sharing that exhilaration with their loved ones. A haiku by Hakucho Ito (1926-2008) goes: "One 'to' (18 liters) of sweat/ No distinction between winners and losers." One victory at the end of long, hard work carries a great weight. And one defeat weighs just the same.